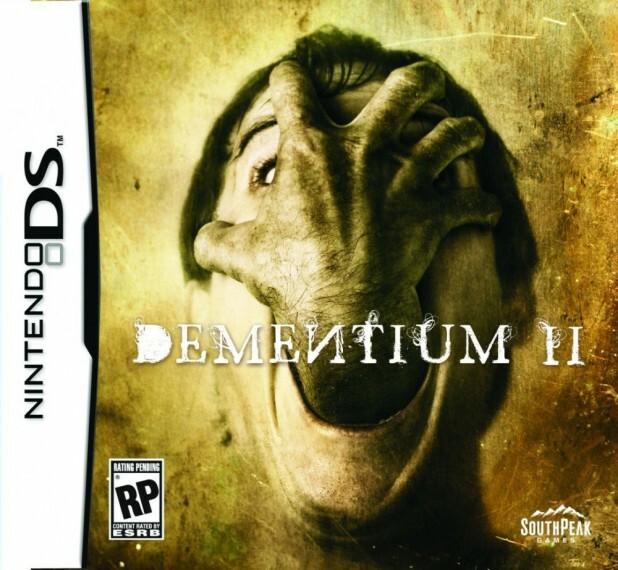 Synopsis: Return the twisted mind of Renegades kid Dementium world in Dementium 2. This is the third FPS from this group and each one gets better and better. The games get smoother and more refined. This is the latest game we got in our review box and kudos to them, and yes, I had to use the diaper that came with it. You play as William as he wakes up from a brain surgery in a prison. You are locked in your cell and you have no idea why. William is taken on a twisted adventure, slipping between two worlds, one with monsters and one with human flesh and blood enemies that chase you all over the damn place. You as the player are left to figure out, which is the real world, and which is your own imagination. Praise: The game is technically sound for the DS. It moves at a smooth 60 frames a second, there is no hitch in the action, and the game has smoother graphics than its predecessor. The enemies are great, they give you a freakish feeling as you are roaming through the prison. 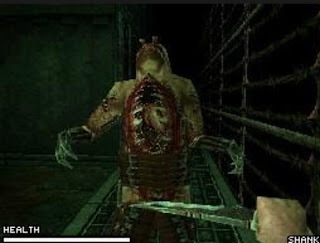 The game is dark and has a Silent Hill esque feeling without following the game too close and making its own unique nitch. The boss battles in this game are awesome, and have a David vs. Goliath feel that never feels overwhelming, but does challenge. One of the things I like most of this game is the smooth item menu. It’s a simple press and drag technique with the stylus which is surprisingly simple but greatly effective. One of the things that was interesting in this is the mouse like style used with the stylus. You use the stylus to look around, crouch, jump, and point one of the many weapons you can obtain in this game. Gripes: Controls, controls, and controls. This game suffers greatly from an awkward control scheme. You have to use the stylus to turn, jump, and crouch. You also have to use, depending on if you’re a leftie or a righty, the cross hairs to move forward, back, strafe right or strafe left the buttons to do the same thing on the other side. The shoulder on the perspective side that you are using to move is the attack with. I know it’s confusing to explain and even more a pain sometimes to control. Another thing of this game is how short it is. Not just short, but REAL SHORT. I beat this game in 5 hours. The other thing that hinders this game some is the AI of the enemies. 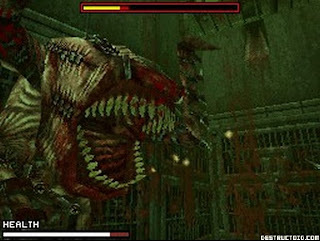 The are not challenging, the bosses are really not all that hard, but worst of all, I hate seeing a grotesque freak of nature running into the wall over and over again trying to get at me. At least they could have changed a Harvard grad to come at me. Or Macgyver, he could have gotten a toothpick, tape, and a paper clip and made a bazooka to come at me with. Overall: This game is not without its faults. Well, if you call a short game and funky control scheme faults and stupid enemies a fault. I look at them as challenges (not the length, I guess if you want to challenge yourself to making it longer, then you can do that). The graphics are great, the game is good. The story line is ok, but not really awe inspiring. Mashbuttons gives Dementium 2 a solid 7 of 10.